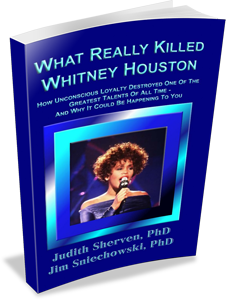 When superstar Whitney Houston died at the age of 48, many people tried to address the question of What Really Killed Whitney Houston. But their answers were superficial—drugs and Bobby Brown. The real answer is now finally available to you—due to the in-depth research and profound revelations provided by husband and wife psychology team Judith Sherven, PhD and Jim Sniechowski, PhD. 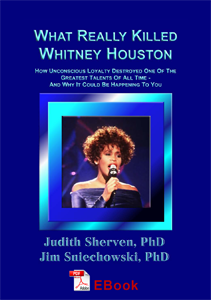 Judith & Jim compassionately expose the depth of Whitney’s unconscious loyalties. 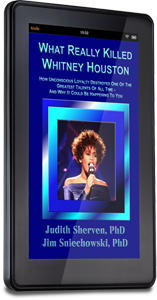 And they explain, despite Whitney’s 170 million record sales and holding the Guinness World Record as the most-awarded female act of all time, how her inner turmoil robbed her from being able to own and live inside her success, and how it ultimately cost her her beauty, her voice, and her life. Come Back and Submit your Amazon Receipt Here!